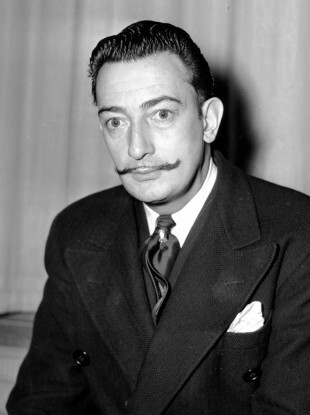 SURREALIST MASTER SALVADOR Dali’s trademark moustache is in perfect shape in its “ten past ten” position, officials said today, a day after his remains were exhumed to settle a paternity claim. “I was very anxious about what I would see,” said Narcis Bardalet, the forensic expert who embalmed Dali back in 1989 and who was at his grave the moment he was exhumed on Thursday night for the DNA test. “I was absolutely stunned. It was like a miracle… his moustache appeared at 10 past 10 and his hair was intact,” Bardalet added during an interview with the public television station TVE1, referring to the positions of the hands on a clock. The arduous task of exhumation involved removing a slab weighing more than a tonne that covered his tomb at the Dali Theatre-Museum in Figueras in northeastern Spain where the eccentric artist was born. Bardalet was one of only a handful of people including a judge allowed to watch the removal of samples from Dali’s remains. “It was a moving moment for him and for us,” Lluis Penuelas Reixach, the secretary general of the Salvador Dali Foundation, told a press conference, in a reference to Bardalet. DNA samples were taken from Dali’s hair, nail and two long bones, he added. Forensic investigators exhumed Salvador Dali’s remains from a tomb in his Spanish hometown nearly three decades after his death in order to test a fortune teller’s claims that she is the only daughter of the surrealist. “The biological specimens have been taken from Salvador Dali’s remains,” Catalonia’s High Court of Justice said in a statement. The DNA samples will be sent to Madrid to undergo the necessary tests. A crowd of onlookers gathered outside the elaborate museum of Dali’s work to watch as police escorted the experts into the building which is topped by a huge metallic dome decorated with egg shapes. Dali designed the building himself. “He would feel at home, it is a day that suits his way of being,” Lorca said. If Abel is confirmed as Dali’s only child, she could be entitled to 25% of the huge fortune and heritage of one of the most celebrated and prolific painters of the 20th century, the woman’s lawyer Enrique Blanquez said. Dali’s estate, which includes properties and hundreds of paintings, is entirely in the hands of the Spanish state. The Salvador Dali Foundation, which manages the estate, says it was worth nearly €400 million at the end of 2016. The Salvador Dali Foundation is to provide details of the exhumation at a press conference today. In an interview with AFP last month, just days after a court ordered the exhumation, Abel said her grandmother had told her she was Dali’s daughter when she was seven or eight years old. Her mother admitted it much later. But according to Abel’s lawyer Blanquez, his affair was “known in the village, there are people who have testified before a notary”. Born on 11 May 1904 in Figueras to a rich family, Dali developed an interest in painting from an early age. In 1922, he began studying at the Fine Arts Academy in Madrid where he developed his first avant-garde artistic ideas in association with poet Federico Garcia Lorca and the filmmaker Luis Bunuel. Soon he left for Paris to join the surrealist movement, giving the school his own personal twist and rocketing to fame with works such as The Great Masturbator. She became his muse – he gave her the pet name Gala – and remained at his side for the rest of her life. They never had children and she died in 1982, seven years before Dali’s death. Email “Decades after his death, Salvador Dali's iconic moustache is still perfectly intact”. Feedback on “Decades after his death, Salvador Dali's iconic moustache is still perfectly intact”.